Investors and commentators are focused on every piece of data and seemed poised to overreact to data points less important than ones released this week. Stay patient, and don’t be surprised by continued swings in the market. Please note that when measured by percentages, the current stock market volatility is close to the historical norm. The stock market wrapped up 2018 with a couple big swings as investors reacted to a series of major announcements. The news sent stocks lower on Thursday, but those losses were erased when stocks soared after an extremely strong jobs report and indications of a more flexible Federal Reserve. Last week also put an end to a difficult 4th quarter that made 2018 a tough year for many investors. The S&P 500 dropped 13.5 percent last quarter, which erased the gains from the first three quarters. ⦁ The Federal Reserve making a mistake. Many in financial markets worried the Fed would raise rates too high, too quickly and stifle economic growth. Last week, the Fed put some of those fears to rest when its Chair, Jerome Powell, suggested the Fed was willing to stop increasing rates during 2019 if there were signs of economic weakness. Investors rejoiced and the three major U.S. indices experienced significant gains on Friday. Friday’s job report reassured investors the economy is still humming along. 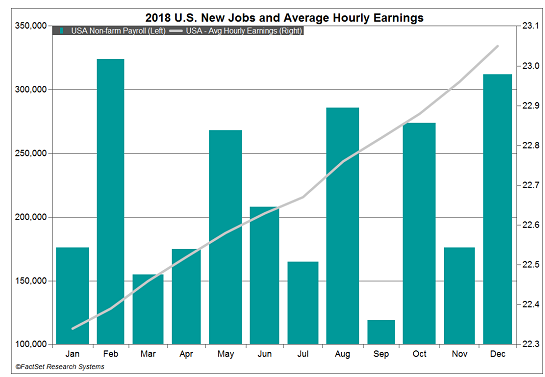 As the accompanying chart shows, more than 300,000 jobs were created in December, and the estimates for October and November were revised upward, too. Wage growth was a healthy 3.2 percent higher year over year. Unemployment rose because more workers entered the workforce or sought out higher-paying jobs. Investors reacted positively to a very good report. ⦁ Weaker corporate profits. Companies were remarkably profitable during the first three quarters of 2018, in part because of the boost from tax reform. However, there were worries fourth quarter earnings would be weaker as the effects of the tax cut stimulus faded. Last week, John Butters of FactSet reported, after three quarters of 25 percent or higher earnings growth, the estimated earnings growth rate for fourth quarter 2018 is 11.4 percent. We feel that 11.4% profit growth is still robust. ⦁ A slowdown in global economic growth. Trade wars and tariffs clouded the outlook for global growth throughout the year. The Economist reported there were signs of economic slowdown in China, and one American technology firm attributed a sharp downturn in its profitability to weaker economic growth in China. There were also signs of economic weakness in Europe. Apple warned revenue would fall about $7 billion short of the mid-range of its previous expectations. The company cited weakness in China as the primary cause of the underperformance. The announcement reinforced the message tariffs are affecting profits and consumer behavior. As anxiety rose during the fourth quarter of 2018, some investors rushed to the perceived safety of bonds. High demand pushed the yield on 10-year Treasury bonds lower as it dropped from 2.99 percent to 2.69 percent during December. ⦁ Markets reacted to a big week of announcements. ⦁ Job growth was extremely strong, and wage growth was very good. ⦁ Fed Chair Jerome Powell signaled flexibility on rates. ⦁ Apple warned weakness in China would affect its quarterly results. A Dutch astronaut accidentally called U.S. rescue services from space. André Kuipers was orbiting the planet and had to contact NASA’s Johnson Space Center in Houston. Kuipers explained he had to dial 9 before making any call, followed by 011 for an international line. Floating and dialing a phone is much harder than you’d think, and he accidentally missed pressing the important zero. It’s only January, but you may want to jumpstart your 2018 taxes since there are a slew of new regulations that may affect you. The Tax Cut and Jobs Act (TCJA) of 2017 went into effect last year so make sure you understand how tax reform may affect your 2018 taxes. ⦁ Children and other dependents. For 2018, you can no longer take a $4,050 deduction for each dependent you claim. The loss of deduction may be partially or fully offset by an increase in the standard deduction. An increase in the child tax credit may help, too, but it isn’t available to all families, reported Maryalene LaPonsie of U.S. News & World Report. ⦁ State and local tax deductions, including property taxes. There is a $10,000 cap on state and local tax deductions, which may negatively affect people in states with high property taxes and/or high state income taxes. Some states have been introducing legislation and researching options that may help offset the loss of this deduction. ⦁ Mortgage interest deductions. For 2018, there is a lower dollar limit on mortgages qualifying for the home mortgage interest deduction. Taxpayers may only deduct interest on $750,000 of qualified residence loans. In previous years, the limit was $1,000,000. ⦁ Home equity loan interest. If you use a home equity loan to build an addition to an existing home or otherwise improve your home, interest on the loan may be deductible. However, through 2026, if the loan is used for something other than home improvements, the loan interest is not deductible. The home equity loan must be secured by the taxpayer’s home. ⦁ Unreimbursed employee expenses. Prior to 2018, money paid out-of-pocket for supplies, education, or other work-related expenses that were not reimbursed by your company, could be deducted up to 2 percent of adjusted gross income. That is no longer the case, reported Bill Bischoff of MarketWatch. ⦁ Various other itemized deductions. In the past, you may have deducted the cost of tax preparation services, safe deposit box rentals, investment fees, IRA/custodian fees, hobby expenses, and other items. Check with your tax professional to be certain, but many of these deductions are no longer deductible. ⦁ Moving expenses. Relocating just became less attractive from a tax perspective. Through 2026, unless you are with the armed forces, you will no longer be able to deduct moving expenses that are not reimbursed by your employer. ⦁ Alimony payments. For divorces after December 31, 2018, the payer of alimony will be unable to deduct alimony payments. Conversely, recipients of alimony payments may no longer pay taxes on the income, according to Lorie Konish of CNBC. If you think you have been the victim of a phone scam, contact the Federal Trade Commission onFTC.gov. You can also report unsolicited communications claiming to be from the IRS by emailing [email protected]. "If you concentrate on finding what is good in every situation, you will discover that your life will suddenly be filled with gratitude, a feeling that nurtures the soul." "Worry doesn't help tomorrow's troubles; it ruins today's happiness."